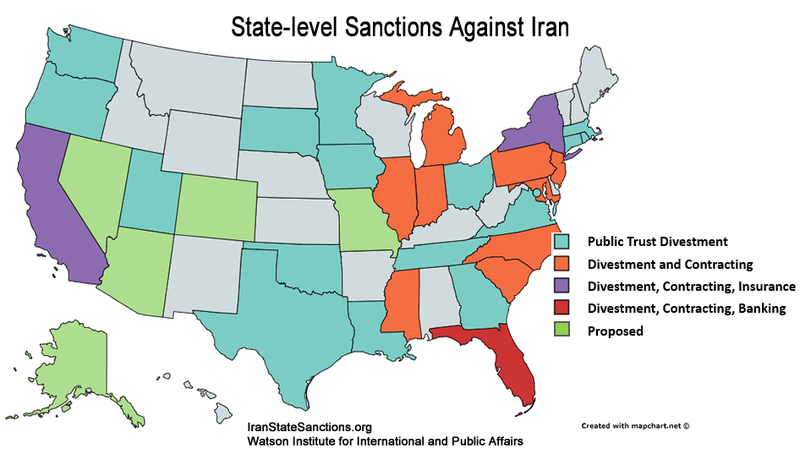 The Iran State Sanctions Project: Brown University’s Watson Institute for International and Public Affairs experts in American politics, security studies, political economy, and the Middle East, working with Brown undergraduate researchers, collaborate here to investigate state governmental involvement in sanctions against Iran following the signing of last year’s Joint Comprehensive Plan of Action (JCPOA). What: Many observers of the JCPOA might not realize that in addition to numerous executive and congressional sanctions, 31 U.S. states also have sanctions against Iran. States’ sanctions call for divestment in Iran and banning business with Iranian companies. Our research identifies and maps out both the types and the impact of Iran sanctions across the states that have them so far. The focus is on tracking whether states will push back against the federal government’s requirement to dismantle sanctions in accord with the implementation of the international nuclear agreement. This website provides a public database resource based on our research. Why does it matter if states have sanctions against Iran: The most important impact of state government sanctions against Iran is that they may thwart the JCPOA, which is a landmark achievement in diplomacy. Sanctions relief for Iran is essential to the success of the nuclear agreement, yet many states are in a position to continue to punish Iran for unwanted behavior. State-level interference is also a potential challenge to executive branch authority in the conduct of US foreign policy: only some states include a provision to end sanctions if the federal government declares that state sanctions infringe on federal power. The terms of the signed nuclear agreement require the White House to “encourage” state and local authorities to “refrain from actions inconsistent” with the arrangements in the Iran agreement. Opponents of the Iran agreement, including lobbyists, can use state-level obstacles to intentionally work to undermine the agreement. This website is based on best available information and is being routinely updated. Corrections welcomed.